The convergence of PR and content marketing is no longer a futuristic idea. In today’s world, everyone is a content publisher, which makes it harder for you to get your message in front of the right people at the right time. In fact, 77% of B2B marketers are creating more content than they did one year ago. 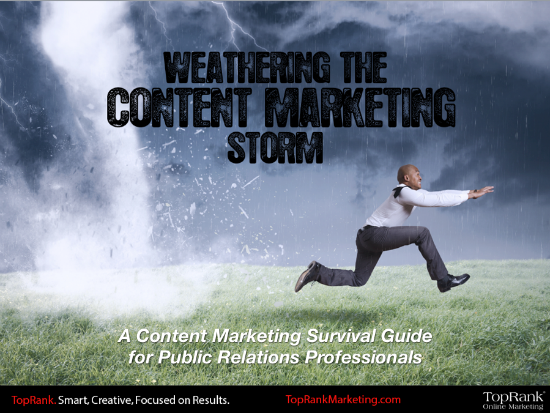 This eBook provides PR professionals with 10 helpful and actionable tips to have you surviving and thriving the impending tempest. Get content marketing advice from one of the top content marketing brands on the web. You can’t afford to wait, download your copy now and begin bracing yourself for the storm ahead! Download TopRank Marketing's content survival guide and find out how to take control of your content marketing strategy.